Yesterday was great. I couldn’t have asked for a better first day back on the wagon. The food was perfect and yummy and filling. The workout was fabulous and, despite being completely spent, left me wanting more! I worked a double today (6am – 10pm), so I prepped all my food last night and took pictures of it all. And then Meal 4 when I got home around 10:30pm. It wasn’t too bad. I was a little frantic when I first started trying to figure out what times to eat throughout the day. When I work the 6am to 10pm double shifts, I usually start off with my first meal around 8am, so I figured that’d be a good place to start. I was originally going to eat my first snack around 10am, however, I didn’t get hungry until almost 11, so I just “toughed it out” until 11:30. I was able to get the toaster oven at work to function, so I made my slice of whole grain bread into toast and put a small amount of light Country Crock spread on it. It was a good and filling breakfast…I mean, heck, I didn’t get hungry again for about 3 hours! The cucumber sandwich was alright. 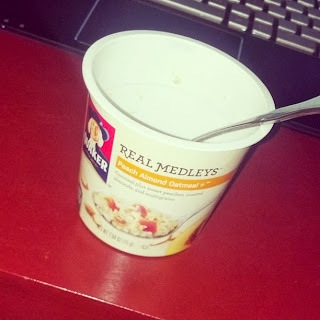 It wasn’t bad…I didn’t not like it, but it was nothing to write home about. It wasn’t gross or weird, just different. I felt very “English” eating it…haha! Of course, the English use cream cheese and not cottage cheese for their cucumber sandwiches…bah, technicalities. The lunchmeat sandwich was good, however one side of the bread was a little soggy and the other side was a little dry from sitting in the container fully made since last night. But, it was still yummy. When I’m at work, a lot of times people are giving out food like candy and baked goods, or they’re making food runs to area restaurants. I almost always participate in these events. But, that’s got to stop. On the morning shift today, someone brought in a huge bag of Halloween candies. But, thankfully, it disappeared rather quickly. There was also some pumpkin pie (which I completely resisted) and some kind of toffee crisp (I had a very small bite sized piece of that). I made good use of some of my “down time” at work this morning and put together my meal plans for the rest of the first week of the diet. Now, of course, Sunday I’m meeting my friend Denise and her hubby for hanging out, which means we’ll be going out for lunch somewhere. So, therefore, I’ll be using my day 7 meal plan for Monday and just eating the restaurant food on Sunday. I might eat something small in the evening…maybe a protein shake or a fruit smoothie…or some beans. Just depends on what I feel like. Also depends on if I go to work out. But, I’ll figure out what I’m going to do on Sunday when Sunday gets here. I don’t even know where we’re going to go to eat. As today went by, I got more and more sore from yesterday’s training session. Awesome! It was mostly in my thighs (inner and quads mostly…a little of the hammies) and a little bit in my calves (from jumping rope). I really hope I can make myself get up tomorrow morning so I can do my 30 minutes on the dreadmill before work. I really want to stick with a minimum of 3 workouts a week. If I can keep that up, coupled with sticking to this diet, I should have no problem reaching my goal of losing 9 lbs by the end of 2013. When I was talking to Tilsa about my workout with Samy yesterday, I told her that he had encouraged me to replicate the workouts I do with him at home as best as I can. I said to do that I’d have to buy a second kettlebell. She said that he can hook me up with a good price on kettlebells from the guy they buy their equipment from for the gym. I’d like to get a pair of either 15 or 18 lb kettlebells to use at home. I just won’t have a heavy rope to use at home. I should ask him what I could use in place of the heavy rope he has at the gym. Last note for the day...I did give in and have 2 Twizzlers.